A compendium of Windows Azure, SQL Azure Database, AppFabric, Windows Azure Platform Appliance and other cloud-computing articles. • Updated 10/6/2011 with five new sessions added to my list of sessions related to Windows Azure at the SharePoint Conference 2011 at the top of the Live Windows Azure Apps, APIs, Tools and Test Harnesses section below. Nice fresh sample from Full Scale180’s guys called Cloud Ninja. This is a sample application demonstrating the use of SQL Azure Federations in a multi-tenant solution. The Cloud Ninja - SQL Azure Federations Project is a sample demonstrating the use of SQL Azure Federations in creating multi-tenant solutions. SQL Azure Federations can be a useful tool for migrating existing single tenant solutions to multi-tenant cloud solutions, as well as building new multi-tenant internet scale solutions. In this project we demonstrate the migration of an existing solution to SQL Azure Federations and further leveraging SQL Azure Federation features in our multi-tenant solutions. The Cloud Ninja Multi-tenant task application makes use of SQL Azure Federations filtered connections in working with tenant data. A connection is opened to a SQL Azure Federations database, the initial connection is opened on the root database. We can then use the "USE FEDERATIONS" statement to route our connection to the correct federation member containing the tenant data, and enable filtering, which will scope our connection to an individual automic unit (unique tenant in our case). We can use the "USE FEDERATIONS" statement to easily route our connection to the root and any federation member as needed. In addition to our multi-tenant applicaiton, we have implemented a simple dashboard to provide a visual of the federation information, as well as perform a SPLIT operation on the tenant federation member. Trent Swanson is a founder at Full Scale 180. There is an old joke in the world of business software that ERP is a roach motel where data goes to die. Like most jokes, this one is rooted in pain. Since the dawn of the modern era of business software, companies have spent huge amounts of time and money entering data into applications like ERP, CRM, SCM, HR, PLM and then struggling to get it out. The multi-billion dollar world of business intelligence software is a fundamental response to this problem. Ornate mechanisms have been created to get data out, clean it, massage it, optimize it, and deliver it at high speed to those who need it to support decisions or the execution of processes. But the world of BI too has longstanding complaints: it is too hard and expensive to manage and support all the infrastructure needed. In addition, when new questions arise, they cannot be answered fast enough. Experts are always involved and they become a bottleneck. All large software vendors are intimately familiar with these concerns. At SAP TechEd in Las Vegas in mid-September, I listened to a variety of presentations outlining SAP’s broad response to opening up its products so that people can more easily get to data and roll their own solutions. Of course, this process has been going on for years, but SAP is moving in some new directions that are worth a close look. If you are an executive paying a hefty bill for SAP, it may be time to reopen the conversation with your SAP experts about what is possible. Some things that have been frustratingly difficult in the past are now much easier. Other things that were unimaginable have become possible. As I pointed out in a previous column (How SAP is Betting its Growth on Partnerships), this openness is not only a matter of making customers happy. SAP’s goals for expansion and growth require openness so that partners can adapt the company’s products to meet the needs of new markets and new types of users. Unless SAP gives partners the tools to tailor its products and create new ones, the company has little hope of growing from €12.5 billion in revenue in 2010 to €20 billion in 2015. In addition, openness should drive sales to existing customers, which should be able to solve more problems by extending the platform. Here are the technologies SAP is betting on to make itself more open to innovation. Simpler data model: Many of the techniques that allow access to data in SAP applications provided access database tables that were designed to serve the needs of programmers. In other words, the data structures are highly abstract and not friendly to average business users. With SAP NetWeaver Gateway, a simplified data model is presented that is far easier to understand. Cross version support: SAP NetWeaver Gateway works the same way no matter if you are back in the stone age of SAP R/3 or using the latest release of the SAP Business Suite that includes ERP, CRM, and several other applications. For companies that have many different versions of SAP applications, and mergers and acquisitions have left more than a few in this state, this is a massive benefit. SAP office graphic from Wikipedia. Muy pleased to be walking the InfoCamp 2011 audience through our latest web platform release, RMC OData. It’s an OData version of the assets found on http://research.microsoft.com. Look forward to seeing what the data community builds with RMC OData. InfoCamp 2011, which will be held on 10/8 and 10/9/2011 at the University of Washington’s Mary Gates Hall, is sold out. What is RMC OData? RMC OData is a queryable version of research.microsoft.com (RMC) data, produced in the OData protocol (see odata.org for more information about the OData protocol). RMC data provides metadata about assets currently published on research.microsoft.com, such as publications, projects, and downloads. Downloads – Applications and tools which can be installed on your own machine or data sets which you can use in your own experiments. Downloads are created by groups from all Microsoft Research labs. Events – Events occurring in different locations around the world hosted by or in collaboration with Microsoft Research, with different themes and subject focus. Groups – Groups from all Microsoft Research labs; groups usually contains a mix of researchers and engineering staff. Labs – Microsoft Research locations around the world. Projects – Projects from all Microsoft Research labs. Publications – Publications authored by or in collaboration with researchers from all Microsoft Research labs. Series – Collections of videos created by Microsoft Research, grouped by event or subject focus. Speakers – Speakers for Microsoft Research videos; in many cases speakers are not Microsoft Research staff. Users – Microsoft Research staff; predominantly researchers but also includes staff from other teams and disciplines within Microsoft Research. Videos – Videos created by Microsoft Research; subjects include research lectures and marketing/promotional segments, some with guest lecturers and visiting speakers. - This query returns all Microsoft Research Downloads. - This query returns all Microsoft Research Videos. - This query returns the metadata for a specific Microsoft Research Download, in this case for asset ID 77034. Note that some browsers return a .part file, which can be opened in text editors or other tools to examine. Generally this workflow is unnecessary when querying for specific assets from applications. - This query returns the metadata for the specific Microsoft Research Video 154104. - This query returns all Microsoft Research staff related to Microsoft Research Download 77034. - This query returns all speakers related to Microsoft Research Video 154104. - This query returns Microsoft Research Projects which contain ‘cloud’ in in their metadata. - This query returns only the name, duration, and URL of the Microsoft Research Videos with duration greater than 4900 seconds, ordered by descending duration. - This query returns Microsoft Research Videos which were recorded in 2011. - This query returns Microsoft Research Videos with ‘farming’ in the metadata. - This query returns all Microsoft Research Videos for all Series; includes the relationship to other assets for each video. - This query returns all Microsoft Research Videos related to Series 150350. For complete information about the system query options supported by the OData protocol, refer to http://www.odata.org/developers/protocols/uri-conventions#OrderBySystemQueryOption. Where do I send feedback about RMC OData? Feedback on RMC OData can be sent to rmcodata-feedback@microsoft.com. Don’t forget to temporarily disable Feeds in IE to display query result sets. The source code is attached for your use and enjoyment. Hopefully the recorded SPC sessions will be posted somewhere; if not and there is sufficient demand (by my random estimate of your interest based on comments to this post) I may try and find a place to post a separate recording I did of the demo...my backup in case of network connectivity issues. I’ve just published a CTP version of “The Developers Guide to AppFabric”. Any feedback on the content would be great, and I will include it in the full release next week. “The Developer’s Guide to AppFabric” is a free e-book for developers who are exploring and leveraging the capabilities of the Azure AppFabric platform. The goal is to create a resource that will evolve and mature in parallel with the Azure AppFabric technologies. The use of an electronic format will allow sections to be added as new technologies are released and improved as the knowledge and experience of using the technologies grows within the developer community. The CTP version, published on the 3th October 2011, marks seven years to the day since the first version of “The Blogger’s Guide to BizTalk” was published. The first section will provide an introduction to the brokered messaging capabilities available in the Azure AppFabric September 2011 release. The next section will go into a lot more depth and explore the brokered messaging feature set. Future sections will cover the Access Control Service, relayed messaging, and cache. Features like the application model and integration services will be covered as they emerge and are released. The book will always be free to download and available in CHM and PDF format, as well as a web based browsable version. The planned release schedule for the remainder of 2011 is to update the guide with new content monthly, around the start of each month. Updates will be made available on the website and announced through my blog and twitter. The feedback form is here. Building integrated SharePoint 2010 and CRM Online solutions. I’ve been hanging out here at the SharePoint Conference (SPC) 2011 in Anaheim, CA this week, and it’s been a blast. Earlier in the week, Jeff Teper announced a key innovation for the cloud: support for Business Connectivity Services (BCS) in SharePoint Online. For those that don’t know, BCS is an evolution of the Business Data Catalog functionality in SharePoint 2007 that enables you to integrate with line-of-business (LOB) data. The BCS, upgraded for SharePoint 2010, provides you with both a declarative way (using SharePoint Designer 2010) and a code-centric way (using Visual Studio 2010) to create what are called external content types (ECTs). An ECT represents a definition file that connects SharePoint to the LOB system and supports both Web-service based connections and ADO.NET connections. You can find out more about BCS here. At SPC, I presented one of ten sessions on the integration between SharePoint and Windows Azure. (It’s amazing to see this topic area grow, and as I see the excitement with developers here I can only surmise it will continue to grow exponentially over the coming months.) The session specifically dealt with integration SPO with Windows Azure—to build purely cloud-based solutions. The focus of the talk concentrated on three core scenarios (Reach, Resource & Reusability) and then discussed some of the identity and security options you have available to you in the cloud across this integration. You can find the deck for the presentation below. This WCF service, though, opens up a tremendous amount of possibilities to pull all types of LOB data into SPO. The figure below provides a high-level view of what the architecture of the demo looked like. In the demo, I used SQL Server as my LOB, had a WCF talking to the SQL Server instance, had created an external content type using SharePoint Designer 2010 (created against my WCF service) which then enabled me to expose the external list in SharePoint Online. I should add here that Mark Kashman, who presented an overview on SharePoint Online a day earlier to me, had walked through the declarative or IT Pro experience for creating the external list. If you’re wondering what the external list looked like in SPO, it was like any other native external list you’ve seen in SharePoint—shown in the figure below. Uploaded my jQuery libraries and CSS templates. I then created a content editor web part (which you can find in the Media and Content category) that then referenced the .txt file by editing the web part and pasting the link to the TXT file in the Content Link field—see figure below . About 100 lines of source code elided for brevity. To give you some idea of what the code is doing, let’s take a quick walk through some of it. More lines of source code elided for brevity. With an object that now contains the employee data, you can now walk through the data object and begin to add content to the jQuery accordian control. This is fairly straightforward and just means using vars to retrieve data from the data object (i.e. empListItems) that you then format within some HTML and add as a content object to the accordian control using the append function. The result is a nicely formatted accordian control that loads the external list data that is stored in SQL Azure (and retrieved via an external content type that communicates with the WCF service). And this didn’t take too much coding to complete. Overall, I’m very excited about this opportunity to connect LOB data with SPO using BCS. And it’s not just because you have a way to implement and surface LOB connections in the cloud; I’m more excited about the possibilities. That is, the WCF service that connects the LOB data endpoint to SPO is mediated by your custom CRUD WCF service, which means you have control over the modeling of the data you bring into SPO and the type/origin of data. And the mere fact that you can model your own LOB data connection means that you could connect to SQL Azure data, oDATA through REST endpoints, and even on-premises LOB data that is using a service bus connection through Windows Azure AppFabric—yes, on-premises data could be surfaced here. In short, there’s a ton of possibility here, and as intelligent developers you’ll figure out and test the parameters of this technology. In closing, I do want to send a thanks to the team that pushed to get this feature out. There were a number of folks that worked very hard to ensure this feature saw the day of light—you guys know who you are. And with developers so passionate about seeing this as core to the SPO developer experience (passionate enough to pass around a petition for its inclusion in one of our developer workshops), I was thrilled to not only see it, but also talk about it this week at SPC 2011. So, nice work on this guys! You’ll see more on this from Microsoft and me moving forward. The exact date of availability will be released through the formal Microsoft channels, but I would think it shouldn’t be too long before you can get your hands on this in the real world. Microsoft’s new preferred name and three-letter abbreviation (TLE) for SharePoint BCS appears to be Business Data Connection (BDC) services. Now you can just package your application and then deploy it to Windows Azure. I have been working towards it since the early beta days, and I can now confidently announce that, in a couple of months, I will release the first, be it very rough, beta, alpha, 0.0.0.0.1-SNAPSHOT version of my LightSwitch skinning extension. Every LightSwitch application has that glowing button in the top right called “Design Screen”. When you ever have the joy of showing LightSwitch, click that button, the runtime editor pops up, and by simply selecting a Bing map control extension from a combo box and hitting save, change your static, auto-generated screen to a vivid and dynamic one. Stop right there. The way I experience LightSwitch, the opposite is to be said on shell and theme extensions, unfortunately. The default implementation really is quite nice, but creating a shell or a decent theme extension is such a huge job in a barely documented maze of code, it feels like it requires a master in advanced nuclear engineering just to stay sane while doing it… What’s even worse, is that there is nothing vivid or dynamic about the end result. So what is skinning then? A skin can be changed at runtime. A button (in the ribbon bar, next to the ‘Design Screen” one), takes the user to the skinning configuration screen. Here, the user can select a skin from a number of predefined skins, and it gets applied immediately, completely changing the look and feel of the entire application. No restarts should be required to see the result. A skin is a package that defines the look and feel of the entire LightSwitch application. It’s a theme extension that fully supports the default shell, screens, all of the control templates, … It’s also a shell extension, offering custom shell controls (navigation, commands, …). A skin can be fine tuned at runtime. The user can change the color or type of brush with just a few clicks for each of the brushes used in all of the control templates. The user can reposition the shell controls, and select which control template to use. Once again, all changes can be previewed and are applied immediately from the skinning configuration screen. A new skin can be downloaded without any hassle. Even in a deployed application, it should be possible for the user to download a new skin and apply it from the skinning configuration screen. A skin is user specific, user group specific, or company specific. The developer of the application can choose and modify the skin to be used, or just create a new, perhaps company specific one. He can choose to empower admin users of the application to change this default skin, set new skins for groups of users or specific individuals, and/or add the right to groups of users to pick their own, personal skin to apply. Yes, I am. But there’s nothing wrong with that, is there? Users will not be able to change the theme (a LightSwitch theme) of the application. LightSwitch themes are chosen by the developer during development. But I’m sure if a shell author want to get creative, a shell can provide their own customizability (not just limited to theming) at runtime by the end user. But as Cromanty suggested, please do add this as a suggested feature on Connect. Despite any number of outages and data breaches, a new study by Symantec shows as many as 87 percent of organizations think moving to cloud infrastructure will improve their overall security (or at least leave it unchanged). But at the same time, Symantec’s findings indicate security remains a roadblock to general cloud adoption — and many IT departments aren’t ready for a cloud migration, regardless. The Symantec State of the Cloud 2011 survey “focused on various forms of cloud computing including Public and Private Software-as-a-Service, Hybrid Infrastructure or Platform-as-Service, as well as Public and Private Infrastructure or Platform-as-a-Service” and incorporated 5,300 responses from users in 38 countries and organizations of all sizes, according to the press release. Even though many expressed optimism about cloud security, it was also a top concern, with many expressing trepidation over malware and hack attacks. Only 15 percent to 18 percent of respondents indicated their IT staffs were “extremely ready” to tackle the cloud challenge, with almost half claiming their techs just aren’t ready at all. The upside of that last statistic for TalkinCloud readers: “3 in 4″ organizations are turning to VARs, service providers, systems integrators and other channel pros to tackle the migration. 75 percent to 81 percent of organizations are considering the cloud, with 73 percent implementing cloud services right now (security services are most popular as per the study, but since the report was generated by security giant Symantec, I take that part at least with a grain of salt). But only 20 percent have implemented every single one of the focus areas mentioned above. Reality and expectations aren’t quite dovetailing: 88 percent expected the cloud to boost IT agility, but only 47 percent say that it actually has, with ROI lower than expected, especially in the areas of disaster recovery, OpEx, efficiency and security. Most of Symantec’s recommendations per the study results are pretty basic: Take the lead in the cloud migration and don’t dawdle; audit solutions and do your homework with quotes and solutions from many vendors so you get the cloud that’s right for you. You don’t have to take an all-or-nothing approach to cloud computing. Leveraging cloud services are an easy first step to moving to the cloud. While it may take time to prepare to move business-critical applications, you can start immediately with simpler applications and services. I can’t agree more — one of the nice things about the so-called cloud revolution is that, despite the hype of tastemakers such as Google or Salesforce.com, SaaS and legacy applications can indeed live together in harmony. Choose the solution that works for you right now, and don’t feel pressured to jump in with both feet just because it’s what everyone else is doing. Note: Les présentations de Cory seront en anglais. NOTE: Un frais de $10 est exigé pour cette journée. Vous devez aussi avoir payé votre membership annuel de $25. Vous êtes familier avec le développement Web avec ASP.Net ou MVC et vous désirez apprendre à migrer vos applications vers Windows Azure ou vous êtes tout simplement curieux et désirez mieux comprendre les enjeux du Cloud et du développement sous Azure ? Ce Samedi .NET est parfait pour vous. Lors de cette journée, vous verrez comment utiliser les grands modules offerts par Azure avec des démonstrations de type « hands-on ». La salle étant en forme d'amphithéatre avec tables, vous serez donc à l'aise pour prendre des notes. N'oubliez pas d'apporter papier et crayons. Il n'est pas nécessaire d'apporter un ordinateur. Pour ceux qui désirent apporter un ordinateur portatif, notez que nous ne garantissons pas que des prises électriques soient disponibles. Veuillez apporter une extension électrique. Notez qu'il n'y aura pas d'accès Internet. Vous désirez suivre les présentations sur votre ordinateur portatif ou vous désirez tout simplement refaire les labs de retour à la maison ou au travail ? Fort simple: pour nos présentations, nous utiliserons les labs du Windows Azure Platform Training Kit. Guy Barrette est un architecte de solutions basé à Montréal, Canada. 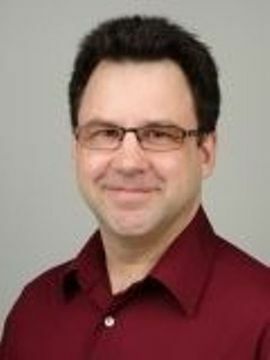 Il est le directeur régional Microsoft pour la région de Montréal et un MVP Windows Azure. Il se spécialise dans les outils de développement Microsoft depuis la sortie de VB 3 en 1994. Guy aide les entreprises à bâtir de meilleures solutions avec les technologies Microsoft. Il a été conférencier lors d'événements MSDN et lors de conférences comme Microsoft TechDays et DevTeach. Depuis 2006, il co-anime le podcast Visual Studio Talk Show. Guy est président de la Communauté .NET Montréal et vous pouvez lire son blog sur guy.dotnet-expertise.com. 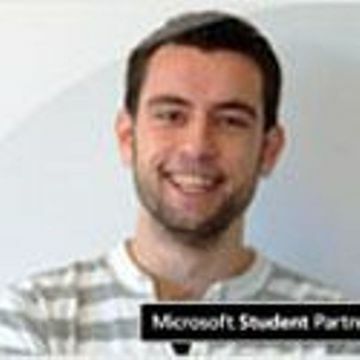 Sébastien Warin est issue de l'école SUPINFO, deux fois vainqueur de la finale française Microsoft Imagine Cup en 2008 et 2009 et gagnant de l'Innovation Award lors de la finale mondiale en 2008 et du Live Services Award en 2009, il est aujourd’hui responsable technique du laboratoire xBrainLab (centre de recherche et d'innovation) ainsi que du système d’information du groupe Wygwam – Usilink. Speaker pour Microsoft sur différents événements, ses compétences couvrent aussi bien les domaines du développements (technologies .NET), de l’ IT (Infrastructure et Cloud Computing) ainsi que des réseaux (technologies Cisco) reconnues par différentes certifications (MCP, MCTS, MCPD, CCNA) et comme Microsoft MVP (Most Valuable Professionnal) sur Windows Azure. Cory Fowler refers to himself as a ‘Developer as a Service’. He is a Technology Community Leader, Mentor and Speaker that enjoys sharing his passion for Software Development with others. 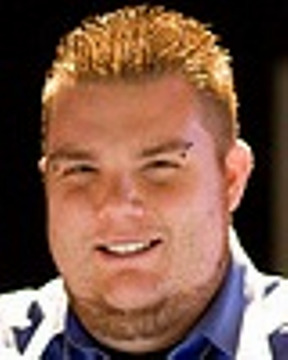 Cory has been awarded with a Microsoft MVP award for his Focus on Windows Azure (Microsoft’s Cloud Computing Platform). Even with his head in the Clouds, Cory finds himself developing a wide range of Solutions including but not limited to Websites (with ASP.NET MVC & Silverlight), Windows Phone 7 Applications (with Silverlight & XNA) and other solutions using the C# Programming Language. Even though Cory works primarily on the Microsoft Stack, he has worked with Open Source Languages in the Past and supports a number of Open Source Software Projects. Now that Oracle OpenWorld is under way, the press releases from Oracle will come fast and furious. This includes speculation that Oracle may unveil its own platform-as-a-service offering, setting it in competition with Microsoft's Azure, Salesforce.com's Heroku, and Engine Yard. In other words, 2009 called. It wants its cloud strategy back. The movement to the cloud has not been as easy as Oracle thought it would be when it jumped in last year. Despite Oracle's dominance in the enterprise database and platform space, many of those who move to the cloud (private, public, or hybrid) do not include Oracle in their plans. This trend was validated in a GigaOm article noting the fact that most of those who move to the cloud are looking to avoid Oracle's hefty software and hardware bills. They opt instead for open source or other less costly solutions to build and deploy their clouds. The core problems with Oracle's cloud computing strategy are that it is late to the party and doesn't really get the value of cloud computing. Cloud computing is about doing things differently, including how you manage data, processes, and storage. Oracle's goal is to make sure that things are done the same way, which means keeping customers on Oracle technology. Oracle shoves its proprietary approaches to computing into boxes that are relabeled as "cloud," then it charges a fee that probably averages a million dollars for most of its customers for the privilege. Oracle's hope is that its customers are so hooked on the Oracle way of doing things that they will find this the easiest path to the cloud. However, as enterprises define their cloud computing strategies, Oracle will be quickly forgotten. The enterprise software and hardware behemoth has been relegated to a legacy role. Its products are still peddled by quota-carrying salespeople who roam the halls of corporate America and the government. That's not how the cloud is sold. How can Oracle fix this legacy problem? I assume it will snap up cloud technology providers like crazy until it has enough market share to be satisfied. However, I suspect even that won't buy Oracle a cloud pass. Oracle needs to commit to being an innovator once again: focus on areas that have been ignored by IBM, Microsoft, and even the emerging public cloud providers. But it will likely remain business as usual at Oracle, and it'll be "me too"-ing its way to the cloud. If Oracle stays on this route, it will become irrelevant. Nobody will care. I know I won't. OpenStack is going to be taking another major step in open governance next year. According to Rackspace, the time has come to form an OpenStack Foundation. Rackspace president Lew Moorman will be discussing an OpenStack Founation during the "state of the union talk" tomorrow at the OpenStack Conference in Boston. Why now? Today I spoke with Rackspace's Mark Collier and Jonathan Bryce, and their response was that now is the time given the level of contributions from other companies. Bryce, chairman of the project policy board, said that it's been talked about since the beginning. However, the fact that the last milestone release had 12 features from eight companies in the OpenStack project showed that OpenStack is "a living, breathing thing, not dependent on any one company." The company has taken some criticism about heavy-handed governance while OpenStack was maturing. Rick Clark, one of the founding members of the Rackspace team guiding OpenStack, voiced concerns about Rackspace's control of the project when he left the company for Cisco. Clark, who took pains to make clear that he felt Rackspace meant the best for the project, said he was still concerned that Rackspace was controlling rather than influencing OpenStack. "Rackspace has a choice to make; they can try to control the project and eventually fail, or they choose to influence it and succeed." It looks like, ultimately, Rackspace is choosing influence over control. responsibilities for OpenStack to the broader community. The role of an OpenStack Foundation will be to manage the last of those responsibilities." McKenty also said that OpenStack has always functioned as a meritocracy. "I think the most fundamental marker of that will be over the coming months - when we see that this next step in the management and organization of the project has almost no impact on the day-to-day functioning of the community, which has relied on merit and so-called 'lazy consensus' since its inception." With OpenStack nearly ready to leave the nest, does Rackspace have any regrets? Collier said that the company had "absolutely no regrets," and that the project had actually been "nothing but positive" for Rackspace. Before, Collier says that companies would plan strategy and come to Rackspace when they decided they needed third-party hosting. Now? Collier says that companies bring Rackspace in to discuss transforming their IT, automating processes, and so on. "It's a much higher level conversation." Collier said that Rackspace will be transitioning the trademark and other intellectual property to a foundation, but the actual makeup of the foundation is still up in the air. One key consideration, said Collier, is ensuring that the foundation has resources on par or better than what is currently provided by Rackspace. "We have a rough idea what resources are needed, the last thing we'd want to do is turn OpenStack over to an underfunded entity." Beyond that, though, Bryce said that the structure for the foundation is to be determined. Why not set up the project with existing foundations, like Apache? Bryce said that it makes sense to have a standalone foundation that's "more like a tightly focused Apache foundation." "OpenStack is made up of very closely related projects that make up a cloud operating system. There's tight coherence around release schedules, integration points, important things to maintain. It makes sense to have something that's just focused on OpenStack because of the tight integration around a broad set of technologies." We'll be watching the foundation formation with great interest. How the project is staffed and funded are going to be crucial to its success. It will be interesting to see how much of the current Rackspace staff that's tasked with OpenStack transitions to the foundation, and where new blood comes from as well. But generally, this looks like a good move. OpenStack has evolved very, very quickly. Mistakes have been made, but not fatal ones. What do you think? What suggestions do you have for the OpenStackers as the project moves towards more independence? A lot of technical tasks that seem simple in theory are often very complex to implement. For example, let's say that you want to encrypt all of the data that you store in Amazon S3. You need to choose an encryption algorithm, create and store keys (while keeping the keys themselves safe from prying eyes), and "bottleneck" your code to ensure that encryption happens as part of every PUT operation and decryption happens as part of every GET operation. You must take care to store the keys in durable fashion, lest you lose them along with access to your encrypted data. In order to save you from going through all of this trouble (and to let you focus on your next killer app), we have implemented Server Side Encryption (SSE) for Amazon S3 to make it easier for you to store your data in encrypted form. You can now request encrypted storage when you store a new object in Amazon S3 or when you copy an existing object. We believe that this important (and often-requested) new feature will be welcomed by our enterprise customers, perhaps as part of an overall strategy to encrypt sensitive data for regulatory or compliance reasons. Decryption of the encrypted data requires no effort on your part. When you GET an encrypted object, we fetch and decrypt the key, and then use it to decrypt your data. We also include an extra header in the response to the GET to let you know that the data was stored in encrypted form in Amazon S3. We encrypt your data using 256-bit AES encryption, also known as AES-256, one of the strongest block ciphers available. 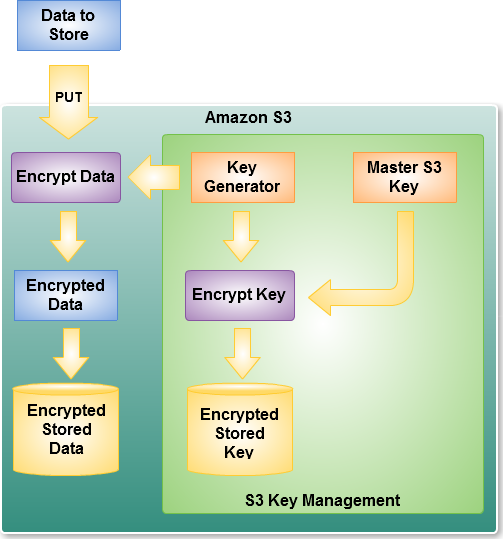 You can apply encryption to data stored using Amazon S3's Standard or Reduced Redundancy Storage options. The entire encryption, key management, and decryption process is inspected and verified internally on a regular basis as part of our existing audit process. You can use Amazon S3's bucket policies to allow, mandate, or forbid encryption at the bucket or object level. You can use the AWS Management Console to upload and access encrypted objects. To learn more, check out the Using Encryption section of the Amazon S3 Developer Guide. I’ve been lobbying (without success, so far) for enabling Transparent Data Encryption (TDE) on SQL Azure. Key management appears to be the primary issue. 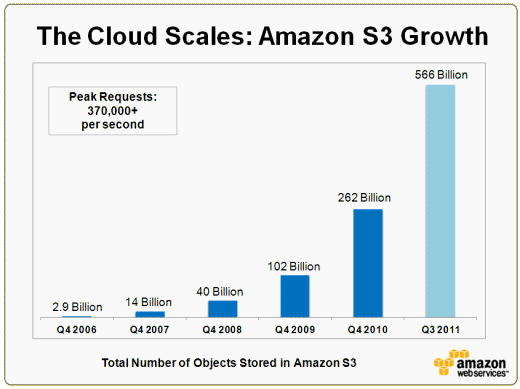 Our customers continue to make very heavy use of Amazon S3. We now process up to 370,000 S3 requests per second. We've doubled the object count in just nine months (the other data points are from Q4). My math skills are a bit rusty but I definitely know exponential growth when I see it! Will cloud computing solve the current unemployment crisis? Probably not, but it’s doing its part. Well, well, well. The Oracle OpenWorld Conference is in full swing, and Salesforce CEO Marc Benioff was scheduled to be one of the keynote speakers tomorrow (Wednesday). “Was” being the operative word here. Thanks to a recent update from Benioff’s Twitter account, it seems that Oracle CEO Larry Ellison has cancelled Mr. Benioff’s keynote tomorrow. As you might have garnered from his tweet, Benioff will likely instead be answering questions and interacting with the media at the Ame Restaurant in the St. Regis Hotel on Wednesday at 10:30 a.m PST. We’ll be there to cover, and will be sure to share any helpful words of advice Benioff has for the man who just gave him the early hook, as they say in showbiz. Now, we’re not in the business of speculating here, but (at least according to Forbes) Benioff upstaged Ellison last year at OpenWorld, poking holes in Oracle’s strategy, in relation to cloud computing specifically, and so there’s very definitely the possibility that Ellison doesn’t want that kind of mockery on stage before he presents a potentially expansive talk on the state of the cloud. Then again, why invite the Salesforce CEO to the conference if you’re just going to un-invite him?